What an excellent idea – just enough information in a very handy format that fits neatly in my purse. Brilliant! What a neat idea. Contains just the right phrases to get you by. Weights nothing, and will slip into a phone case or pocket with ease. These little cards are a brilliant idea and really handy! I’m trying to learn the basics and these are perfect! I have just received this and I am delighted. 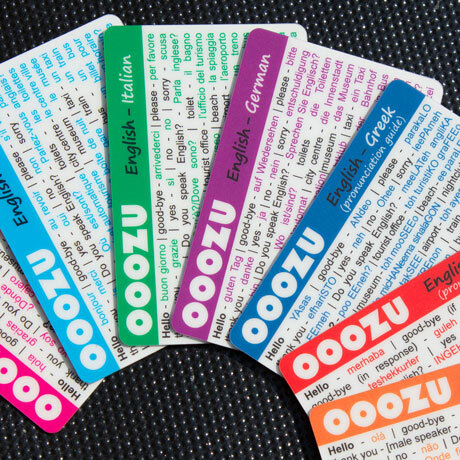 I always fumble with phrase books, never finding the right word quickly enough, but this card has the absolute essentials at my fingertips. Very pleased with this product. An absolutely brilliant idea which has been produced as an easy to carry card. Easy to read and full of relevant words that I can see I will be using.